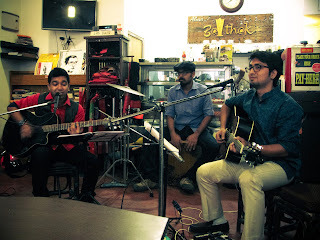 Our Correspondent ● Kolkata: The renowned musicians Surajit, Arkopravo and Sougata have come together to form Mainam, a band constantly experimenting with excellence. Café Abar Baithak with the similar habit of experimenting with the trade of hosting programmes has given Mainam a chance to perform its heart out on 10 January morning. Mainam is known for folk and country music but it’s not much behind in originality. Another specialty of the band is Spanish songs. They performed popular Spanish numbers like Baila Me (Gypsy King), Luna (Juanes), Corazon Espinado (Santana), Lambada (Kaoma) and Ei Mariachi (Los Lobos). Sharing the experience of performing at this particular venue, Surajit said, performance at Abar Baithak means more than just a programme. He liked the way people here interact with live performers during shows. Thus it turns into an ‘adda’, he added. Coming from diverse background the three members of Mainam are looking forward to introduce their listeners with the band's original Bengali numbers. They are planning another live performance at Abar Baithak on 21 February. That would feature popular Bengali numbers like Opekshay, Brishti, Kotha Theke Ashey Chole etc.